Let me just state right now, this is all Darren’s fault. Today I had lunch with my good friends Ben and Darren and a couple of their friends. I recently discovered that these two guys – though my experimentation with The Pioneer Woman’s Cinnamon Rolls (makes them and people WILL fall at your feet to worship you. always an odd experience) – are almost more passionate about all things cinnamon than they are about assorted geekery. We were in the excellent Bill’s cafe, where on display there are various gourmet wonders you can buy and take home. As we were waiting to be seated Darren noticed bags of cinnamon star cookies. His eyes lit up like the metaphorical Christmas tree. Let me pause there for a moment to expound a pet theory of mine – imagine me in a leather, winged back chair, wearing a smoking jacket, swirling a glass of brandy by an open fire. Developers are trained to have an inbuilt desire to see how things work. Show a geek a cool do-hicky and after the initial reaction of ‘oh that cool’ they immediately want to know how it’s made. Never leave a geek with a screwdriver unattended near anything you own because I guarantee they will try and take it apart. Now imagine what you get when you combine a classic developer with a foodie. You end up with someone who will try and re-create and improve on almost everything they taste. As we sat down and starting looking at the menu I started mulling. surely I could make those cinnamon star cookies? How hard could it be? I turned to my trusty iPod – gateway to the world – and powered up safari. Alas I had obviously left my baby unattended near a microsofty at some point as the default search engine has been changed to Bing, oh well. Five minutes later I had a recipe. My afternoon plans were set. A quick store cupboard check later and shock-horror, I was out of ground almonds! Darn! I had used almost all of them up last week making a chicken korma (a BBC recipe, rather good). 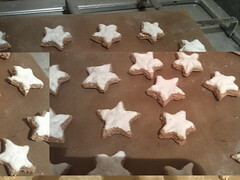 But no, I was a geek on a mission – a mission to make cinnamon stars and nothing would get in my way! I would just go and buy some ground almonds, twitter came to my aid, @teamawnty2012 told me where the nearest shop that sold ground almonds was, a 10 minute nip to Oxford Road and I had possibley the largest bag of ground almonds I’ve ever owned. I decided to use this as my base recipe – http://www.cakespy.com/blog/2009/11/11/seeing-stars-cinnamon-star-holiday-cookie-recipe-from-breden.html – I stuck to it pretty well, except I didn’t have any lemon zest and I put some lemon juice in the icing to thin it a bit. Creating the ‘dough’ went well enough, it was quite sloppy but, who was I to argue with what someone I’ve never met said on the internet? Onto the rolling out.. This is where it all started to fall apart. I ended up with a squishy paste between two bits of grease proof paper. I pealed back the top layer and knew this would end in tears. It did not look appetising. Oh well, maybe there was some magic that I wasn’t aware of that would make it all better, time to attempt cutting out. There wasn’t. Magic that it. That’s it. The recipe was a failure, I should just go and eat the raw dough and watch a chick flick I thought – but then! Inspiration hit! My cookie press! That is designed to pump out cookies from sloppy dough right? How could it go wrong? Well it did. lets just draw a veil over those few minutes. But no, I have never be beaten by a recipe yet I cried! To which my mind instantly bought forth the memory of my first (and currently only) attempt at macaroons. or my Little Pony Droppings as my beloved tasting panel nicknamed them. The macaroons did not go well either. So. I brought out more icing sugar, I scraped together the ball of almond smelling cement and LIBERALLY sprinkled the work surface. Who am I kidding? I carpet bombed the thing. Slapped down the warm handful of goo and considered the state of proceedings. Thank you for that thought brain, but no, I have cookies to make. Star shaped cookies. I got the paste into a sort of flattish round with my hands, no more rolling pin for me and added another half inch of icing sugar to the top, flattened it down and started to cut out in earnest. Things started to get better, dipping the cutter in water between each cut helped, gently pushing it out by each point produced a nicely “home make look” star (read wonky), ok, fantastic, yes! Take THAT crazy internet recipe! 3 trays later, 10 minutes baking. I got the cookies out of the oven and it was worse than you can imagine. Yep. I had created MUTANT COOKIES OF DOOM. But I was committed now, I just need to ice these monstrosities, stick them back in the oven for the icing to harden in a baked Alaska type way and I’m done. Just look at this one. You think these look hideous in the photos, you should see them in real life. This must be how a parent feels when they realise their offspring doesn’t know the difference between star trek and star wars, and more importantly DOESN’T CARE. So, my kitchen looks like a bomb has hit it, my cooling rack is full of little mutated globs of almondness and to cap it all! They don’t even smell of cinnamon. In conclusion, at least for the time being, this geek is happy not to know exactly how to make everything she sees. Although. how hard can it be? I’m going back to the kitchen. Oh yes. It turns out I do, indeed rock. Details at a later date but for now, I’m going to bed!